On our last weekend in Montego Bay, Jamaica many people queued for hours to visit the Logos Hope. To bless these people as they wait patiently in line we held a concert on the stage outside the ship. Early on Saturday morning the AV and events teams got our hands dirty putting out a portable stage and setting up some serious AV equipment to provide a high quality sound that could be heard far away. 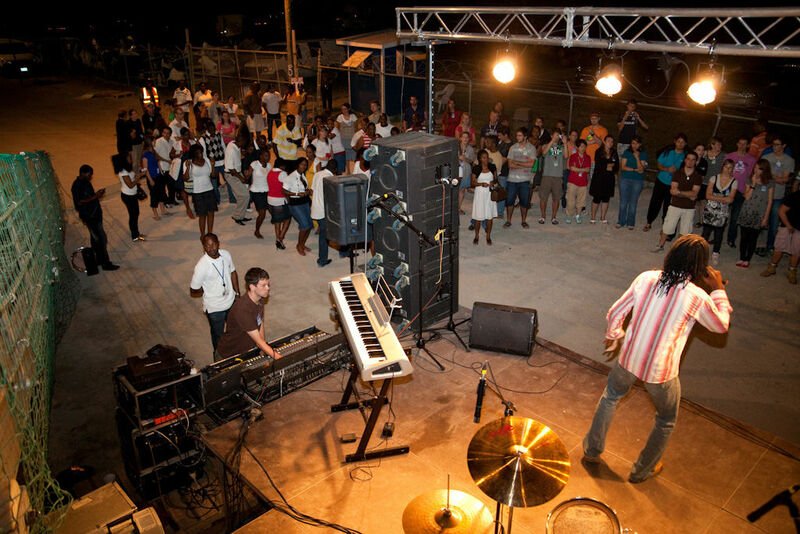 Local artists and crew members performed on stage and people were captivated by their performance. Many shared their testimonies and the Gospel. Pictured above is Sam Stainer from the U.K, the newest member of my AV team. He is a professional audio engineer and has run his own AV business for a few years before he visited the ship in London. He was impressed by the opening ceremony and talked with the AV manager on board who encouraged him to join up for two years. Immediately he decided this was what he would do, so he began to close down his business and a year later arrived in Montego bay. Praise God for bringing the right people at the right time!